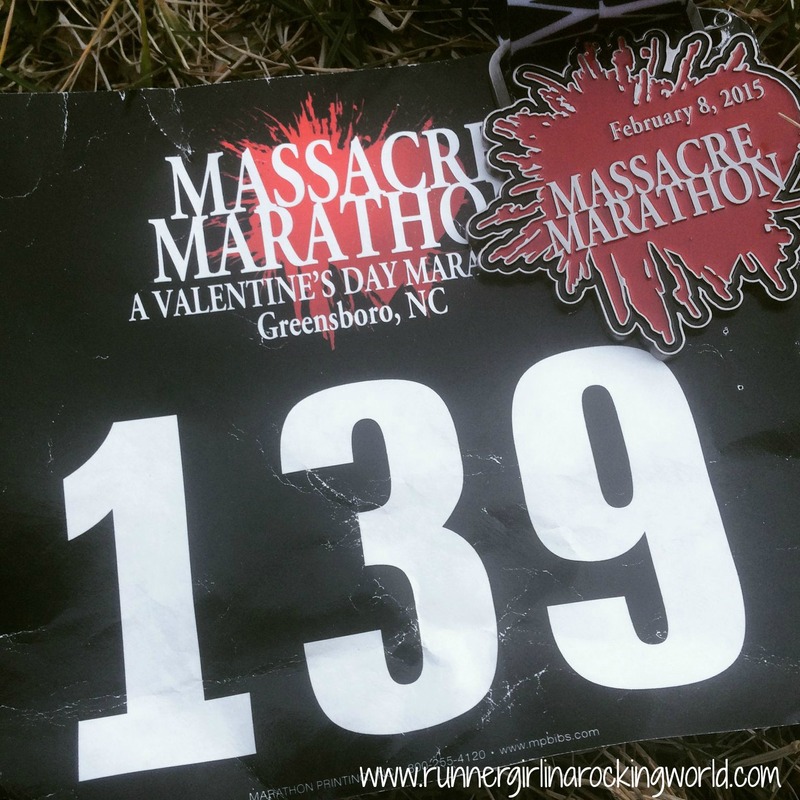 Yesterday was the Massacre Marathon Relay, a Valentine’s Day tradition in Greensboro. Every year, 2 and 4 person teams make loops around Country Park. 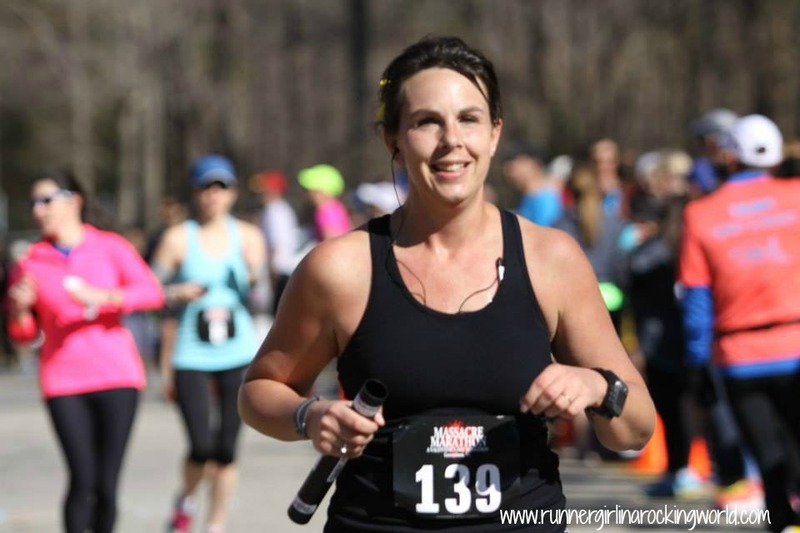 Those who are brave enough to run the whole thing solo can conquer all 16 laps for a marathon distance. This year, they added in super groups where you could have a team of 5-8. The weather usually is quite chilly and many teams bring portable heaters and tents to shelter themselves from the wind and cold. This year with temps reaching 72 degrees, it was a near perfect day! We set up our camp with a few chairs and blankets just to have a place to rest if we needed it. The course is a 1.6 mile loop around Country Park. The route is rather hilly, climbing for the first .5 of a mile of each lap with a few downhill stretches, before another decent climb. The last .4 of each loop is mostly downhill. The total elevation gain for all of my laps plus the extra mileage I did was 1,421 feet! That’s hillier than the City of Oaks Marathon! 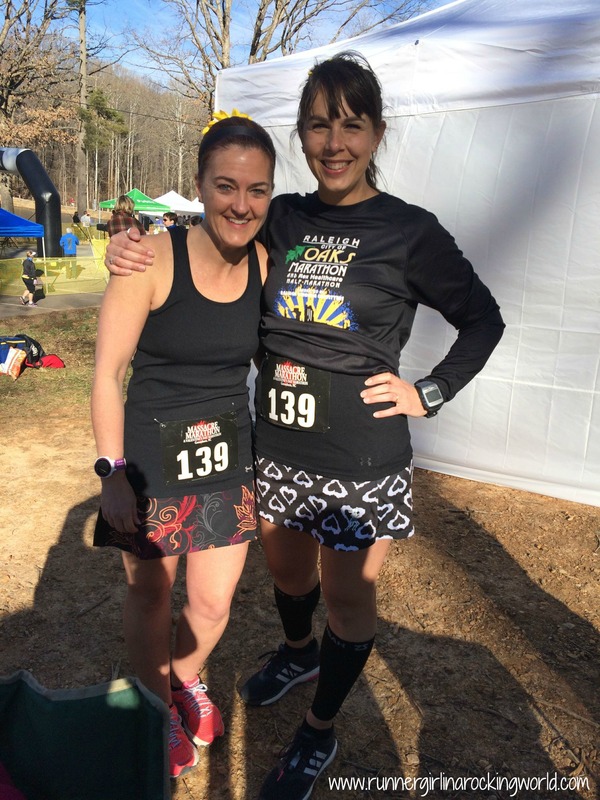 Christine and I were on a two person all girl team, each running a half marathon distance. We had 15 miles to run yesterday so we got in some extra miles throughout the day. Henry and Carole were on a two person team, as well. We had other friends that were on a 4 person team and Cara, who was running with Christine so they could practice pacing for our March race, City of the Arts half. Our strategy was to each run 4 laps then switch off. We have some leeway with 2 people teams. 4 person teams must switch runners after each lap. I started the race off and ran the first super loop (2.2 miles). My intentions were to run this as a training run and for maybe the first 1/2 mile I did that. After that, I found myself picking up my pace and running way faster than I should have. The race bug caught me and I just went with it. I completed my first lap in 19:34 (8:54 pace). Um, yeah…that’s not training run pace nor HR appropriate. I went on to run the next 3 loops (1.6 miles each) at a similar pace. I kept telling myself to slow down, but no matter how much I fussed at myself, I just keep running fast. I finished the next three loops and happily passed off the baton to Christine. I rested the best I could, grabbed some water and ate half my Clif Bar I brought with me. I chatted with several friends and waited for Christine to come back every loop. After her 4th loop, we agreed quickly on the hand off that we’d go to 2 laps each next. Because I was recovered while she ran, she needed a bit more time than just one lap to catch her breath. I ran the next lap, my fastest of the day, at 14:12 (8:53 pace). I just kept going and running. I looped around one more time, a bit slower and handed off to Christine. She said she could go around 2 laps and then we’d do 1 lap and switch for the last four. We were both getting tired! She ran her two laps and passed off to me. It was a treat at this point to run just one lap. By my last lap, my slowest of the day, I was done. I had nothing left in the tank. The hills had taken a toll on me. I was running faster than I had in months and I was tired. I finished 13.37 miles in 2:04:07. I was super surprised and happy with having pushed it. I didn’t regret the decision to just run hard. Christine came around on her last lap. I met her to run through the finish line together! We finished just under 4:30, 4:29:04! 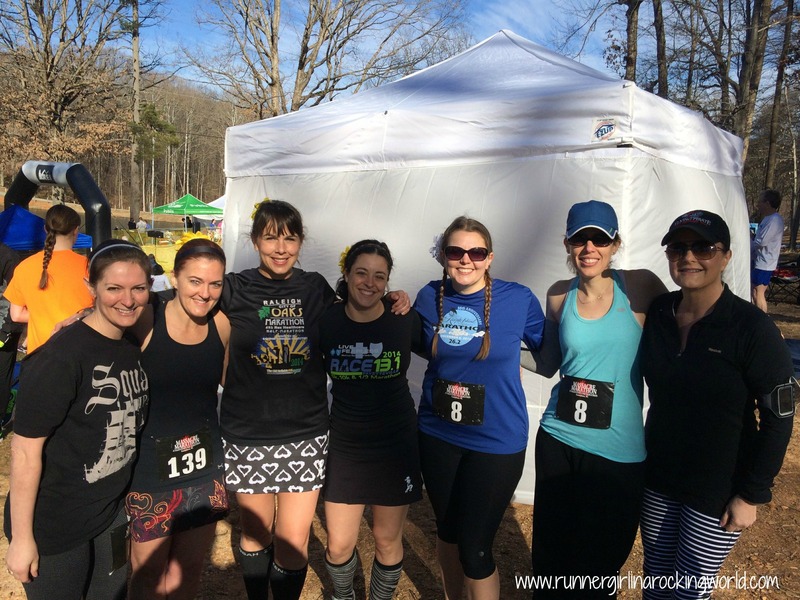 We were the 4th place 2 woman team. Holy smokes! We did amazing!! We grabbed our medals, took a few pictures and packed up our belongings and headed for a much needed lunch! Overall it was a great day! I’m two races into the year and up an awesome hoodie! Immediately after the race, many of us were just tired, hungry and a bit grumpy. Usually we have the post race glow, but yesterday was more like a post race ugh. We felt beaten up and just worn out. It was definitely not the ending to the day we thought we’d have. Now thinking on it this morning, I feel the glow coming on. We ran 26 miles in two days. Before we ran the race, we ran 11 miles on Saturday. 11 miles?! Of course we were going into the race tired. I think it was just what we needed though. For Gasparilla, the miles are about the same that we just ran. We have 12.3 miles on that Saturday and 18 miles on Sunday. 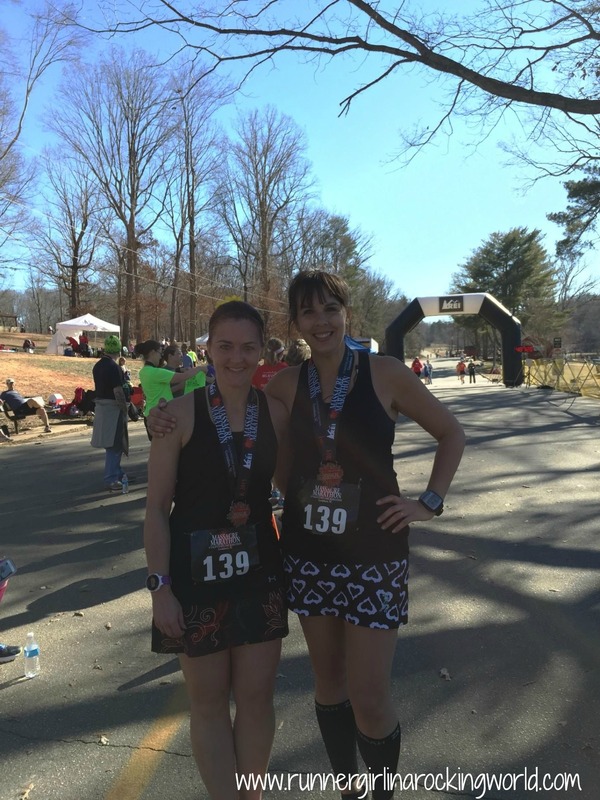 We ran 11 this past Saturday and 15 at the race. We’re only 4 miles short of race day. I even more confidence now! The medal and hoodie! Just do it for that alone. It’s also a great way to spend the day with your running friends. The options for different sized teams makes it easy to find friends to run with you. The addition of the REI tent with music was nice although with the beautiful weather, I was outside in the sun and heat most of the time. Can’t change the course, but man, those hills! Sounds like such a fun race and a cool idea. Thanks for sharing! It really is a great event! I have yet to do a relay, but that sounds like fun! that is an amazing job! I would love to do a relay run- how fun is that! I love that you got a hoodie- I got one for the Hot Chocolate run and that was one of the reasons I wanted to do it! 🙂 and who doesn’t want the word massacre across their chest- to cool!!! !